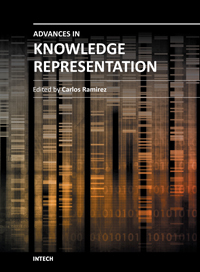 Advances in Knowledge Representation offers a compilation of state of the art research works on topics such as concept theory, positive relational algebra and k-relations, structured, visual and ontological models of knowledge representation, as well as detailed descriptions of applications to various domains, such as semantic representation and extraction, intelligent information retrieval, program proof checking, complex planning, and data preparation for knowledge modelling, and a extensive bibliography. It is a valuable contribution to the advancement of the field. The expected readers are advanced students and researchers on the knowledge representation field and related areas; it may also help to computer oriented practitioners of diverse fields looking for ideas on how to develop a knowledge-based application.